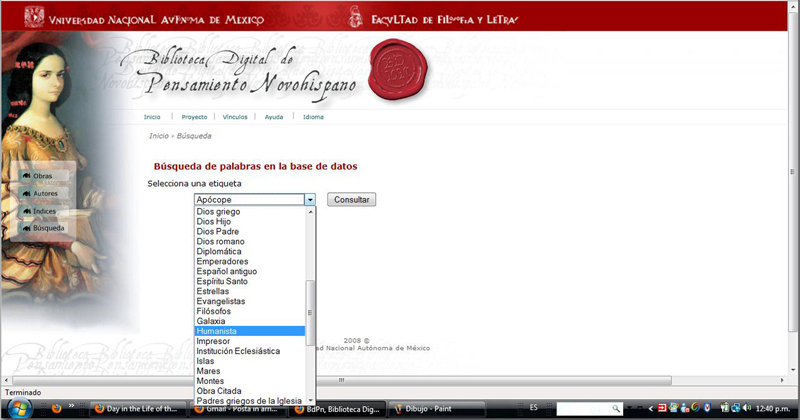 This paper presents the Digital Library of New Hispanic Thought (Biblioteca Digital del Pensamiento Novohispano). In Mexico, during the seventeenth century, two comets were observed, leading to the publication of various texts on the meaning of this astrological phenomenon (Trabulse 1994a). During this period relatively few books were published due to high costs, the required approval of the Inquisition for publication and the lack of potential buyers. This proliferation of publications on the subject can be viewed as an indication of the importance of these events for the Catholic Church, the colonial government and the intellectuals of the period (Trabulse 1994b). The Heavens were, in Spanish colonial Mexico, a scientific, religious, social, political and ideological battleground (Moreno 1998). To this date most digitization projects for New Hispanic publications, namely Google Books and Biblioteca Virtual Cervantes, have focused primarily on access and preservation and although useful, do not constitute digital scholarly editions. The original aim of this project was to provide the basis for a critical digital edition through collaborative commentary of digital diplomatic transcriptions. The process however, in particular during the migration of our tailor made DTD to using TEI, also served as a research tool which enabled us to develop a conceptual framework to formulate further research on these texts. 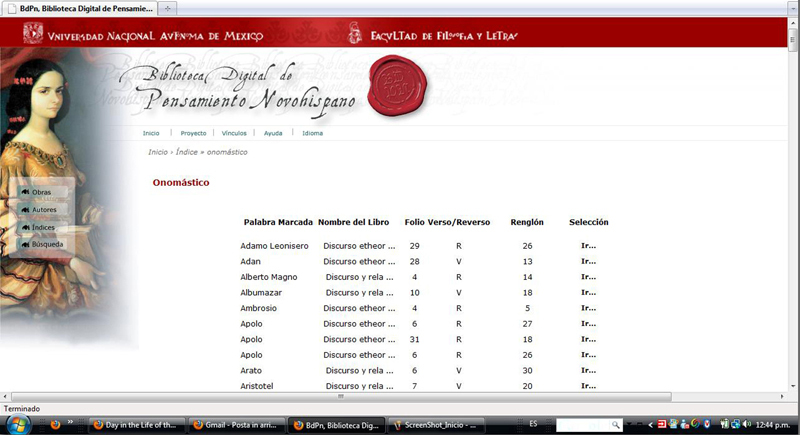 This is the first project from our university to use XML and TEI. The original aim of the project was to make available in digital format the first book by Fray Diego Rodríguez, published in 1652. However, this idea was quickly superseded as we realized that, taking into consideration the relatively large number of books on comets and astrology published in this period, it was more desirable to present all texts as a corpus. We therefore decided to focus on the common theme of astrology/astronomy with the main objective of not only gathering and creating a corpora and providing access but also developing and publishing a digital critical edition with tools to aid scholars in their research. The outcome is the publication of all known texts of the period, eight in total.1 With the exception of one, none of these texts has ever been reedited. Up to now, due to the fact that the ideas contained within these texts were no longer of any scientific value, the text itself has not been considered particularly important. Moreover, of the few studies that exist on these publications, the tendency is to view them as general testimonies rather than concentrating on the texts themselves (Cf. Navarro, 1959 and Cullen, 1984). This new edition of the texts in digital format gave us the opportunity to examine the text in detail and reconsider previous interpretations. The eight texts were transcribed into plain text digital format and diplomatic transcriptions were produced. The only text that had been reedited previously had been updated for spelling and grammar as well as correcting original errors, in order to make it more readable for a modern, non-academic audience (Cf. Navarro 1959 and Cullen 1984). Other editions had been facsimiles (Trabulse 2001). As the BDPN is aimed mainly at specialists and we wished to both preserve the texts as faithfully as possible and to provide analytical tools, diplomatic transcriptions were considered the most adequate. The texts were then marked up in XML. We wished to approach the text with no preexisting theory or structure –and as a part of pedagogical approach to the use of XML as a research tool-, allowing the text to speak for itself. In order to do this we set about producing categories as the text was analysed. These categories were then converted into tags which eventually formed the DTD for the XML mark up. The objective of this was that the analysis of the text for creating the DTD was in itself a critical analysis. Once our own DTD had been developed, we then began the process to migrate to TEI. In order to do so we sorted through our categories and found equivalents. This process helped us define a new conceptual framework for studying the texts. Additionally the system includes expert commentary on the text (see Fig.3). Specialists in the subject may obtain a username and password that allows them to comment on the texts and these appear as part of the critical edition. This provides the framework for future national and international collaboration on these particular texts. The project is not conceived as a closed edition and it will hopefully continue to be expanded to permit new enquiries of research to be developed. The original DTD was used to identify all possible elements that could be of interest to the study; from classical mythology and Christian metaphysics to geographic and geospatial indicators. Almost one hundred categories were identified. Once the text was marked up using our DTD we then migrated to TEI Lite. In order to do so we needed to find equivalents for our elements. This migration process obliged us to refine our categories and interestingly to simplify our analytic framework. As we started using common TEI tags such as date, place, name, with the type attribute, we realized that we could eliminate many of our tailor made categories as they were redundant or too specific. This process helped us to identify the truly relevant categories for these texts. For example, source (citation, commentary, authors), geographical and geospatial terms, diseases associated with comets and old Spanish terms. Significantly, the migration to TEI allowed us to identify all the comets mentioned in the corpus using the element attribution date. Now that we have identified the thematic structure of theses texts using these categories, we now know that we wish to focus our research on astrological themes used, diseases commonly associated with comets, geographical areas affected by astrological predictions and the type of Spanish used in the period. A key issue in the development of this project was to produce enough documentation so that this can survive as an open ended project, allowing new texts to be incorporated when and if they are discovered. It is known many Humanities projects do not develop adequate documentation that allows text files to be reused (Warwick, et al. 2009). Our experience shows that creating adequate documentation is extremely difficult. One of the main problems was the frequent changes in the tags. As the text was analysed and marked up, this tended to produce new requirements. It proved difficult to maintain the documentation up to date in order to describe and explain all the considerations and changes. This is a very time consuming process. It is difficult to anticipate these changes and to contemplate them adequately in the project timeline. The work done thus far has initially helped us to view all these texts as a network. This had not been done previously. Additionally in order to develop the tags we approached the texts with no preconceived structure and this has allowed completely new concepts to emerge from the texts. The move to TEI helped us to identify with precision the framework with which to approach further research into the text and produce a new reading of this corpus. In the future we hope to incorporate the facsimiles as images and mark them up so that specific parts of the image can be associated with the textual transcription. We also hope to generate international interest in these documents that up to now have been hidden in specialized libraries, mainly in Mexico. 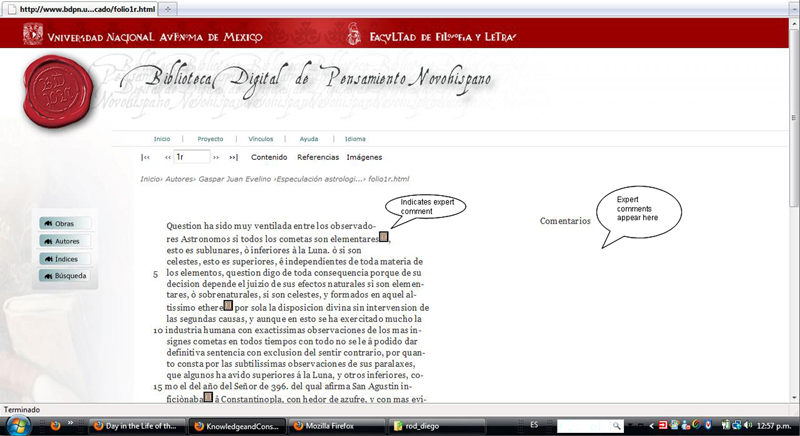 There is currently little critical digital content in Spanish in general and of this period in particular. We aim ultimately to generate new research on the subject and we believe that this tool can contribute to the study of New Hispanic thought. Additionally we aim to generate research and publications that also reflect on the experience of producing pre-modern electronic textual editions.